Thank you for considering the Woodland Chamber of Commerce as a key investment for marketing your business in 2019. Signing up for one of our sponsorship levels will enable you to get the most out of your advertising investment and is the only way to receive prime ad space on the Woodland Chamber of Commerce website all year long. The Woodland Chamber offers two options for signing up. Our first option allows you to select from one of our three sponsorship levels that have already been created to include the most desired incentives; visibility to the community, involvement in the Woodland Chamber, premium locations at all your chosen events and more. Our second option is to have a custom package personalized for your business needs. This option is a great choice if your business needs maximum exposure with limited involvement. This can also be an excellent choice if your marketing budget is not found in option one. We have been very successful over the years in creating the “Biggest Bang for Your Buck” all while offering the most desired incentives. With popular Chamber events held each year, our sponsorship opportunities range in scope and price. 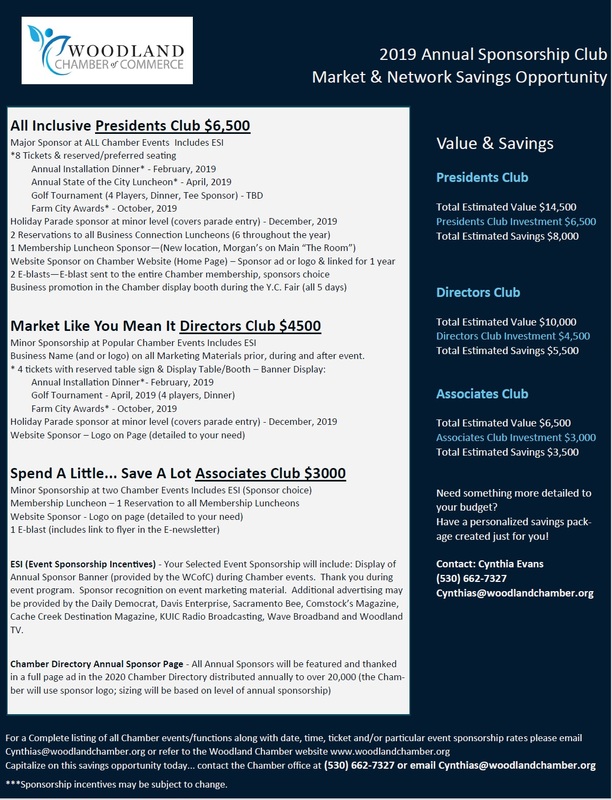 If you take a look at the President’s Club level, you will see all the events listed with sponsor opportunities. 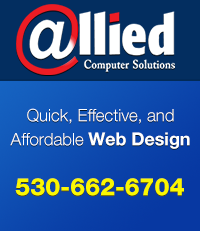 Signing up is easy, just give us a call or send in an email. As always, thank you for your support of the Woodland Chamber of Commerce. REFERRALS – Chamber representatives and staff send business your way! Callers, walk-ins and visitors are sent to you – Chamber members are referred exclusively. NETWORKING – Business Networking Events (Monthly Mingle & Coffee & connections), Ribbon Cuttings and General Membership Luncheons, offer an opportunity to meet new contacts. Personal contact is the best way to sell, we’ll introduce you! SPONSORSHIP’S at our annual special events such as: the Annual Installation Dinner, Golf Tournament, Farm/City Events, and Holiday Parade. FREE Listing in the Chamber Directory and Regional Profile – 17,000 distributed annually. EXPOSURE on the World Wide Web with a FREE listing and link on the Chambers website www.woodlandchamber.org and on Facebook.com/woodlandchamberofcommerce. COMMITTEES-get a competitive edge over non-members with first hand information on a variety of hot topics. List provided upon request. New members to the Chamber are encouraged to hold an Open House and/or Ribbon Cutting to announce your joining the largest business organization in the County. Photos are featured in the Chamber Website, Facebook, Instagram, and our Chamber Insider in the local paper. Add your event to the Chamber Community Event Calendar on our E-blasts, website and Facebook page for FREE! Add your business coupons on our NEW Member Coupon Page on our website FREE! Looking to hire? Send us your flyer/notice to put on our Job Posting Website page. Official City of Woodland/Yolo County map FREE $3.00 ea. Small Business Development Center Services Consulting. Contact the Chamber office for details. Whether it`s through the referral system, the Chamber Directory, local newspaper, email blasts, visitor`s bureau, or sponsorship’s of events, whatever venue you chose, we can definitely let folks know about your business! Since 1925, the Woodland Chamber of Commerce has served as the voice of business. Our mission is to foster an economic climate in which Business, Industry and Agriculture flourish. Represents Business Interests to Government. We`re located in the historical district at: 400 Court Street, Woodland, California.